has been named "Freshman of the Year" by the Sun Conference on the US college golf circuit. Great news coming close after Sammy finishing second in the Sun Conference Women's Championship 54-hole tournament at Pooler, Georgia. Sammy, pictured, from Roehampton, shot rounds of 73, 77 and 74 for a total of 224 - one stroke behind the winner, Paulina Camacho (SCAD Savannah), who had scores of 73, 76 and 74. It was an exciting finish with Camacho double bogeying the 16th in her final round but then birdieing the 17th and 18th to regain the lead from Fuller. Sammy, a former Junior Vagliano Trophy player, bogeyed the 14th and 16th in her final round. 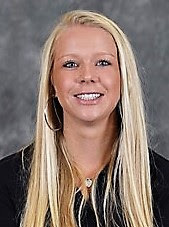 Essex girl Emily Turner, a senior student at South Carolina Beaufort University, finished T6 on 231 with scores of 81, 78 and 72. Emily's 72 was the best by anyone in the final round. Pity she lost a lot of ground on the leaders with her two opening scores. There was a field of 35 players. The team event was won by SCAD Savannah with a total of 911, seven ahead of South Carolina Beaufort (918) with Keiser (935) third.